Not all the beaches on the Hawaiian Islands have pristine, sandy shorelines. Kamilo Beach on the southeast end of the Big Island, for one, tends to attract more trash than sunbathers. As a result, the remote beach has become a site for what researchers have dubbed “plastiglomerate”: rocks of sediment and marine debris melted together with plastic. 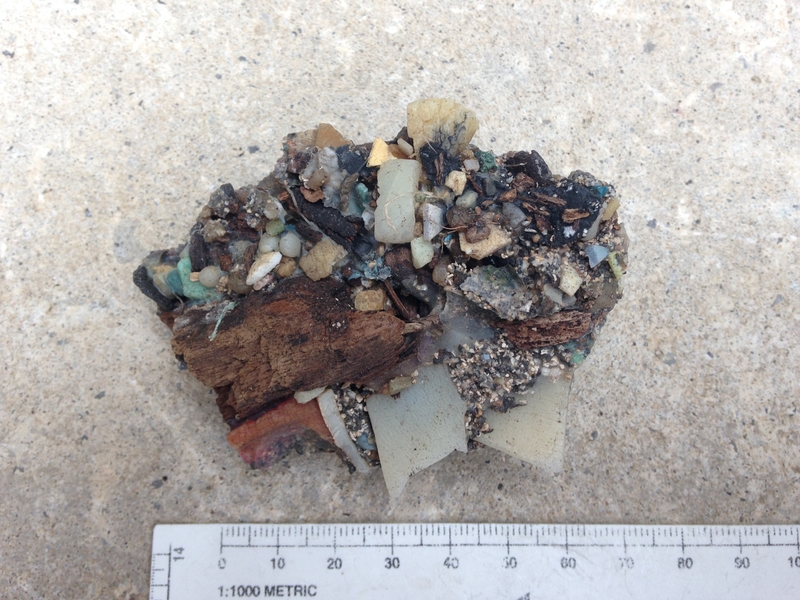 Patricia Corcoran, an associate professor of geology at the University of Western Ontario, found more than 200 pieces of plastiglomerate at 21 sites along Kamilo Beach a couple summers ago. She reported her findings last June in GSA Today. The pieces that Corcoran found contained various natural material, including sand, volcanic rock, wood, and shells. But “all of them had plastic for sure, because that’s what melded everything together,” says Corcoran. The variety of plastic ranged from ropes, nets, and fishing tubes, to bottle lids and package containers. According to Corcoran, Moore had initially suggested that lava flowing out of a volcano formed the rocks by melting the plastic. “But in looking at the volcanological history of the island, it had been centuries—or even longer—since there was an active flow in that region near Kamilo Beach,” Corcoran says, and plastic has been manufactured en masse only since the 1950s. The sun’s rays probably weren’t responsible, either, because temperatures of 185 degrees Fahrenheit (85 degrees Celsius) or higher are necessary to melt most common plastics. “We knew it couldn’t have been a natural process that melted the plastic,” she says. Corcoran suspects that campfires are instead to blame. Kamilo Beach is mostly deserted, but of those who visit, many cook out on the beach. When they build campfires, the hot coals burn the surrounding trash. Much of the plastic and other garbage gets washed in by the North Pacific Gyre, which circulates clockwise around the Hawaiian Islands, depositing materials along the southeastern shorelines. Because of its location at the southern tip of the Big Island, Kamilo Beach likely snags flotsam as ocean currents sweep by. Based on visible markings on some of the products, a lot of the rubbish comes from other countries such as China and Japan, as well as parts of Europe, according to Corcoran. “It’s coming from all over the world,” she says. Corcoran is the first to publish research on the phenomenon. But considering the huge amount of plastics consumed globally, and that these plastiglomerates form anthropogenically, she says she wouldn’t be surprised if other people have noticed the rocks in different locales. Still, since publishing her study, she’s only heard from one other person who’s discovered a fragment outside of Kamilo Beach—and that was on another Hawaiian island. On the off chance you happen across a piece of plastiglomerate, what should you do? Though there’s no definitive solution, leaving it on the beach could be environmentally hazardous—the debris could get buried and potentially disrupt the flow of nutrients in the groundwater, posits Corcoran. While incineration is better than simply burning the rocks—the former can contain plastic pollutants—the process is expensive, and facilities are hard to find.